The notion of the romantic outlaw is one that has long held the public imagination. Butch Cassidy and the Sundance Kid. Bonnie and Clyde. Jesse James. All the way back to Robin Hood. Toronto has its own historical outlaw in the person of Edwin Boyd, a World War II vet turned bank robber, whose gang terrified and captivated the city with a string of brazen heists in the late ’40s and early ’50s. But in Nathan Morlando’s film,Edwin Boyd: Citizen Gangster (2011), the tone is less romantic idealism and more tragic grimness, marching on with a pervasive sense of doom. Toronto’s own Scott Speedman plays the titular character. A veteran of the Second World War, Boyd is disillusioned by his barely-getting-by life as a Toronto bus driver. With a wife he met in England during the war and two young children to support, he is finding it increasingly difficult to make ends meet. To add to this, Boyd has deep, unfulfilled dreams of making it as a star in Hollywood, a desire frowned upon by his retired policeman father, played by Brian Cox. Cox’s portrayal shows a man who disapproves of his son’s life and terrible decisions, but is made more poignant by his sad attempts to maintain a father-son relationship. In a moment of desperation, Boyd grabs an old pistol, disguises his face with theatrical greasepaint, and goes out to rob a bank; this sets off a series of events leading to what ends up being Canada’s most infamous crime spree. Notably, the Boyd gang’s breakout of the Don Jail forms the very first news story of then-fledgling news broadcast network, CBC. In this film, first-time filmmaker Morlando turns his focus away from the sensationalist views of the gang found in contemporaneous accounts of their escapades – “Unbelievable and unstoppable!” cries one radio newsman when the gang holds another bank heist the very day after breaking out of jail. Instead, Morlando narrows in on the often heartbreaking motivations behind Boyd’s actions, and those of the other members of the gang. The beauty of this movie is that the supporting characters aren’t just there to prop up the lead’s main storyline. Each person is fully fleshed out, with all their hopes, and fears, and desires. Lenny Jackson (played masterfully by Kevin Durand) is a big muscular guy, the picture of the hardened criminal. There is an uneasy relationship between him and Boyd, given the attention lavished on the latter by the media; yet the two of them, both war vets, have a deep, unspoken brotherly bond. Durand’s portrayal is of a man whose vulnerability is cloaked by a gruff, practical-minded exterior, but who reveals his poetic side to the woman he loves, Ann Roberts. One of only two women in the group, Ann, subtly played by Melanie Scrofano, reveals the human side to Lenny, behind the ruthless criminal in the headlines and on the radio. Val Kozak (Joseph Cross) is in a similar bind as Boyd, with a young wife and a desperate need to support his family. But he is also carrying on an affair with Mary Mitchell (Charlotte Sullivan), a fur-coat-wearing, flashy blonde party girl, whose flamboyant facade reveals a woman with past hurts and a deep-seated need for love and attention. The movie, filmed in winter-locked Sault Ste Marie standing in for post-war Toronto, is beautifully shot. A period piece, it nonetheless has the vibe and urgency of any modern thriller. With bank heist scenes shot on a handheld camera, the fast-moving, jerky shots yank the viewer into the thick of the action. The music also surprises, because while it features songs and music from the post-WW II time period – one scene has the gang sitting around Boyd’s wife’s living room singing an impromptu rendition of “Praise the Lord and Pass the Ammunition!” – it also has a soundtrack featuring a sound reminiscent of contemporary bands, and fast-paced music is often set to the bank robbing scenes. With all the action and incredible storytelling, it’s easy to forget that this is based on a true story, that all of this really happened. In addition to directing, Morlando also wrote the script, based on a series of phone calls to the real-life Edwin Boyd before his death in the early 2000s. 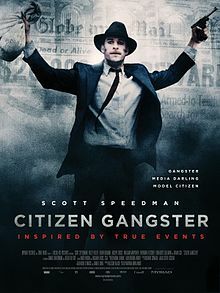 But to bring the viewer right into the middle of the story, it makes use of newspapers from the era and archival newsreel footage to add a layer of reality to a movie already saturated with gritty realism. But it wasn’t all dark. In the way society often is, Boyd had as many fans as he did detractors, if not more; and Morlando captures the heady excitement of people living through these events. However, underlying the sometimes manic excitement is a pervasive sense of grim foreboding. The boisterous action is set up against much more subdued scenes, like the ones between Boyd and his wife, Doreen (Kelly Reilly), as their marriage grows increasingly strained. Despite the fact that Boyd’s initial motivation was a bid to provide for his young family and prove himself as a man, the nature of his lifestyle proves too much for her to handle. Whenever a siren screams past their window, all activities are dropped while they wait tensely to see if it will stop outside their apartment. Their relationship is a poignant thread holding the film together and Reilly’s performance evokes a woman torn between love for her husband and a desire to keep her family safe. In every scene and with every questionable decision made by the characters, the viewer is made fully aware that things will not end well; this is a feeling that grows as the movie progresses, and the tension tightens like a too-tightly-wound spring, making you await with dread the inevitable snap. With unflinching cinematography and incredible cast performances, including a nuanced depiction of a complex personality by Scott Speedman, this film is an exercise in excellent storytelling. It may even make you look at Canadian history a little differently. This entry was posted in Film and tagged Edwin Boyd, Kevin Durand, Nathan Morlando, scott speedman. Bookmark the permalink.